We have the capability to offer our clients with high quality 'Megna' pressed steel studded wheels gang-mower. All gears in these mowers are fitted with bearing to ensure their longer life. We are manufacturer of Gang Mower. We have have One unit Gang Mower & Three Unit Gang Mower. 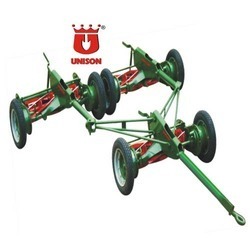 - Frame : the ganging frames have a common unit frame- the framework is so designed that there are no upward projections, thus enabling the mowers to run under low hanging trees etc. And cut grass will not adhere to choke the mowers. - Chassis : unbreakable, reinforced steel, firmly braced by axle and bottom block assembly. 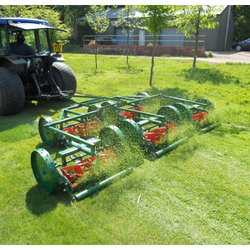 Specifications • Frame : The ganging frames have a common unit frame- The Framework is so designed that there are no upward projections, thus enabling the mowers to run under low hanging trees etc. And cut grass will not adhere to choke the mowers. Cutting Height: 1/2 To 8 Inches. Frame: The ganging frames have a common unit frame unbreakable, reinforced steel, firmly braced by axle and bottom block assembly. Transmission: The cylinder at both ends from the road wheels through hardened steel machined cut gears. Gear Drive Type: All gears are fitted with bearing for longer life. Adjustment : Cutting Height Can Be Adjusted From 1/2 To 8 Inches. We offer Lawn Mowers that are widely used as garden tool. Some of its characteristics. - Frame : The ganging frames have a common unit frame. - Chassis : Unbreakable, Reinforced steel. - Gear Drive Type : All gears are fitted. - Clutch : A clutch is fitted to each gear box to engage the drive to the cutting cylinder.